Ready for a burst of color? If so, then head on over to Boz Schurr’s mural (Ísland to Island) Korpúlfsstaðir and The 23hr Sunset, located at Spalding House’s outdoor Surface Gallery. The mural is the perfect visual pick-me-up for any dreary day, and it also evokes the joyous feeling of when it’s downright beautiful outside. The mural is currently in its last week—it leaves Spalding House on June 30, 2018. Although worth it, viewing it these days will actually give you a different experience than if you saw it before the last week of April. That’s because some junior high and high schoolers gave it a sweet makeover as part of Schurr’s Mural Painting at Spalding House class. Taking place during the Art School’s Spring 2018 semester, young artists of all skills got to improvise and collaborate on how to repaint over Schurr’s lively mural. Why would she offer up her mural like that, you may ask yourself. For one, the original mural was a reflection of her summer art residency in Iceland. Imagery focuses on her feelings of loneliness and depression while living on a former dairy farm on the outskirts of Reykjavik—an isolating place that received 23 hours of daylight. “I believe there is a stigma surrounding mental illness and by making it a subject of the mural gives me an opportunity to discuss it openly with young adults who may be dealing with similar feelings,” she says. “Covering the work was symbolic of healing and moving forward. The students focused on the theme of personal identity, which as Schurr says, is a tough and tumultuous concept when you’re in middle school. To help them sort their thoughts out, she gave them questions to think about each week. They’d always come back with new ideas and stories. Now the mural is covered in bold figures and shapes of varying artistic styles and colors. 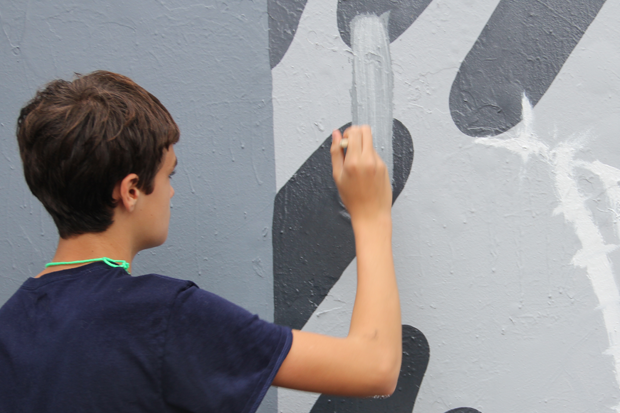 Don’t miss out on seeing the work of these future muralists! It is wonderful to see the issue of mental health being addressed in such a creative way by school students. The article not only encompasses the facts but also the emotions one would feel when they stand there.